Ok guys. This post just might freak you out and make you stop following. But I guess it's best for every one to find out what I'm really like rather than thinking of me as some amazing blogger. K, I did a video. Well, I guess you could call it a vlog. Any ways, the main reason for it was so that Natalia and her siblings can see what I'm showing in the video (keeping it a secret...shhh), because I know they'd like that. I also just sought of did a tour of my room (because i felt like it! ha...), so you're welcome to watch that if you dare. But the part about me rambling on about a parcel in the mail, you really honestly don't have to watch it. It just might bore you to tears. Like I said, it's for Natalia and her siblings! Yes, so that's my little video. I hope for Natalia and her siblings' sake, that it's not too bad and congratulations to you if you actually got through it all! p.s. thoughts on the new design? it's not quite finished, but mostly done. thanks a heap to kayleebeth for designing it! 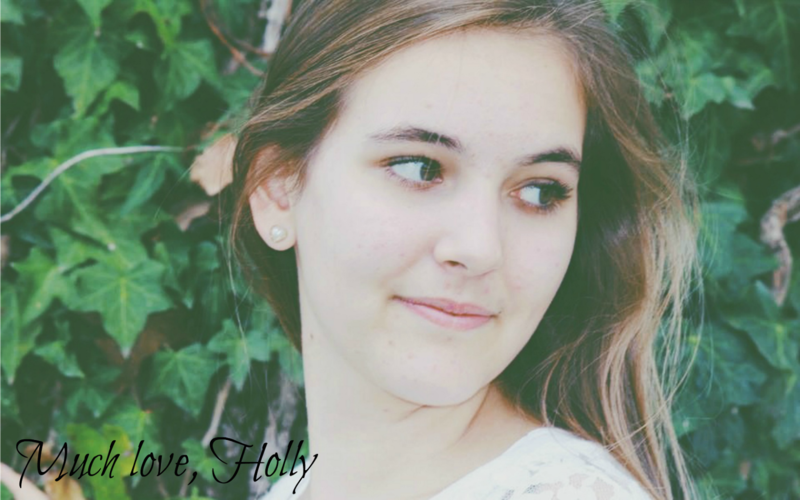 Aww..... you so sweet Holly. Thank you Lindsey! You are so sweet...my accent isn't that interesting, is it?! PS. Maybe I should try this on my blog one day! This is sweet. LOVE the new template! It was nice 'seeing' you again, and I really loved watching you on camera, you are just so sweet Holly! Ha ha, love the "OW!" in the video, around 2 and a half minutes through. Seriously girl, you and your room are just GREAT! (OK, I share a room with 3 sisters, and can't wait to move in with my older sister in her room, 'cause the one I;m in atm gets REALLY loud and messy!) GREAT video btw.